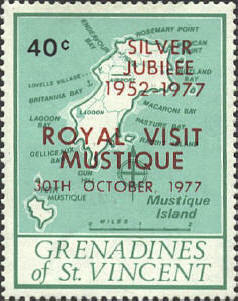 These stamps were issued in 1977 to celebrate the visit of Queen Elizabeth to Mustique Islands in the Grenadines of St. Vincent on October 30, 1977 as a part of her Silver Jubilee tour of the Commonwealth. Captain Kidd, Blackbeard, Henry Morgan, Anne Bonney and Mary Read are well known as pirates. While pirates preyed on ships throughout the world, they were especially active in the West Indies in the eighteenth century. Among these pirates was a Dutchman, Jost Van Dyke. One of the islands in the British Virgin Islands was named for him. Dr. John C. Lettsome, the founder of the British Medical Society was born on Little Jost Van Dyke in 1744, and William Thornton, the architect of the United States Capitol Building and the first Secretary of Patents in the United States was born on Jost Van Dyke. 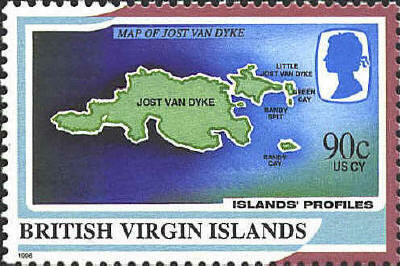 In 1996 the British Virgin Islands issued a set of four stamps with subjects relating to the island of Jost Van Dyke, of which the map is one. 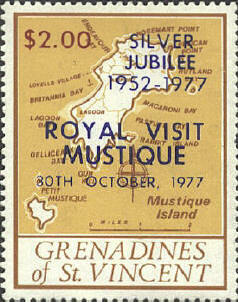 The stamp issued by the British Virgin Islands in 1993 to celebrate "25 Years of Ministerial Government" shows a shaded relief map of the islands. The four largest islands, Tortula, Viergin Gorda, Jost van Dyke and Anegada are identified by name, The Sir Francis Drake Channel between Tortula and some smaller islands is also identified. The island of Anegada which is approximately 33 miles to the northeast is in a box at the top of the map. There are no coordinates, no scale and no orientation indicated on the map. In the lower right hand area there is what appears to be a ceremonial mace.